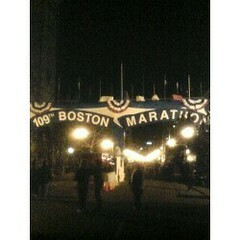 One of the things I always wanted to do was run in the Boston Marathon. Tonight I probably got as close as I ever will, when I "ran" across the finish line not once, but three times. I always heard that finishing a marathon was one of the toughest things you can do, but if you start at the end, it's really not too tough. I did it over and over without breaking a sweat. In a related note, I am by far the fattest person in my hotel.